Edwin is a native of Cayuga County, born in town of Aurelius, May 27, 1829. His early life was passed upon the farm and he received his education in Academies at Auburn and Genoa. In 1854 he went to Ottawa, Ill., where, in 1857, he engaged in banking and continued until 1866, when he returned to Auburn. From 1868 to 1890 he was engaged in the manufacture of gloves and mittens. In 1892 he founded the banking house of EDWIN R. FAY & SONS, his two sons, Fred H. (1857-1926) and Charles R. (1859-1930), being members of the firm. Mr. Fay has also been a Trustee of the AUBURN SAVINGS BANK since 1880 and its President since 1894. 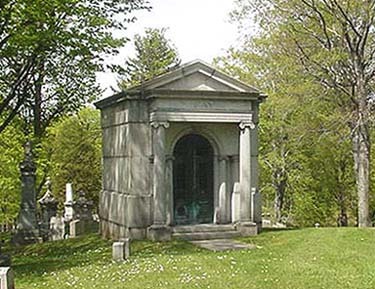 Edwin R. Fay was also on the Fort Hill Cemetery Board of Trustees from 1908 to 1918. From the October 1967 brochure: "The National Bank of Auburn...commemorating 150 years of service". On February 1st, 1923, The National Bank of Auburn was further enlarged by the merger with it of the private banking house of Edwin R. Fay & Sons, which had successfully operated under that name for a period of thirty years. George S. Bailey and George Olmsted, who had been at the Fay window for a quarter of a century, took up duties in the merged bank. Charles R. Fay became a director of The National Bank of Auburn, where he served until his death in 1930. Edwin was married to Jane Maria Van Vechten. Jane's sister was Caroline (1829-1914), who married Wadsworth Hollister (1828-1895). Edwin R Fay, house 174 Genesee, also president of Auburn Savings Bank. 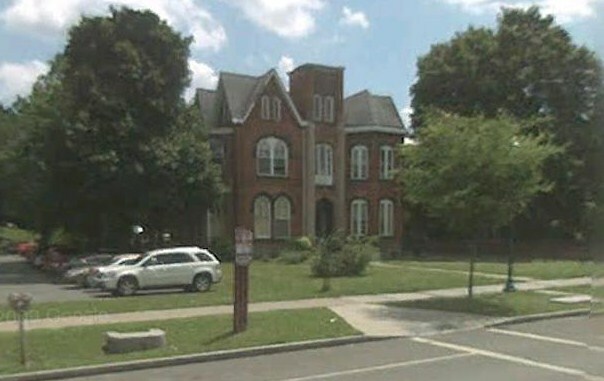 His house still stands next to Seymour Library, having been made into apartments many years ago. The Fay lot is located in the Ridgeland section of the cemetery.